everything went smoothly, via your website, emails. Great service, well run group. Arriving at the Sanctuary toward the end of the day, we found the home to be easily accessible, bright, clean and welcoming. We headed right down to the beach for a sunset game of touch football and let the dog chase the ball to his heart's content. The weather was absolutely gorgeous, cloudless and warm for Fall. We had several teens with us, they loved being let loose on the beach and in town, and had a blast. Overall, a terrific weekend. Thanks! Tell us about your favorite feature of the property. -Proximity to the beach, -excellent size for our group, comfortable -great kitchen - dog friendliness. Our entry code didn't work upon arrival, and the staff member I spoke to on the phone was very friendly and knowledgeable and solved the problem within seconds. Thank you! This house has EVERYTHING. Fantastic location and view with a secret back staircase to beach access. The double decks and view from the hot tub are amazing. The house is comfortable, roomy, and had everything we needed and more. It's perfectly located perched with a view of the ocean and sunset but still just a short walk along the beach to town. And the king bed in the master suite is ridiculously comfortable. We'll definitely be back! The location and view are AMAZING. And the entire house is just so lovely, welcoming, comfortable, and perfect in every way. I've stayed in dozens of houses in Manzanita, and this one is by far my favorite. We've always had efficient, friendly experiences so far. The members of your team were very helpful in setting up my reservation. The process was quick and easy. The house was very clean, cozy, and quiet. The beds were very comfortable. Great location for walking to the town. We would stay again! All of our experiences have been through email communications and all of our queries have been answered promptly and professionally. This is a great place to relax and make yourself home while enjoying the beauty of Manzanita, the ocean, and Neahkahnie Mountain. It's also a perfect base for visiting many of the other small beach communities along the coast. 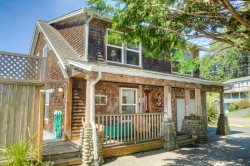 The house is well situated, with close access to the beach and town, as well as a great view of the ocean and Neahkahnie Mountain. The house itself is very well equipped and very comfortable. This was the first year we had difficulty getting into the house. The team forgot to send us the code to get in. Luckily it was resolved by a visit to the office before it closed. So comfortable! Well be back!! The members of your team were good. A very clean, well-organized house. Light, airy, clean. Close to town and the beach, but quiet. It was easy to book through VRBO. My reservation was quite last minute but that didn't seem to bother anybody. They were quick to respond to my request and had everything taken care of before I knew it. I couldn't check-in early because there were guests there but I was able to check out late with no problem. The key pad on the front door certainly helps streamline the process of not having to stop in an office somewhere to pick up keys! They were very accommodating and quick to respond to any questions asked. Johnny's Garden was the perfect peaceful beach getaway. It has a nice open layout on the second (main) floor and is bright, cozy, very quiet and peaceful. The back of the house is nestled in amongst trees and the front is open to the sky/road. It's only a couple of blocks to the beach which makes for a nice walk anytime of day. There were two deer to wish me farewell the morning I left! There are more amenities than even listed on the site. It was clean and I felt safe being there alone. That's saying a lot for a girl from the 'big city'. :) I would stay again in a heartbeat. The space had LOTS of windows so lots of natural light. It was well-insulated, though,so it never felt cold or drafty. Large spacious home in a quiet neighborhood perfect for restorative getaway. Outdoor fire pit was great! Very comfortable. Well appointed for adults and children alike (not to mention pups). Exactly as advertised! The space in the bedrooms and living area were perfect for our family gathering. Only a few things were less than excellent. It would be nice to have a cheese grater. Also, more glasses! With 5 staying there we had to run the dishwasher a lot. And some of the washcloths were stained - looked liked they were used for cleaning sometimes. Tell us about your favorite feature of the property. The view and the fireplace! The few times I called, the staff was prompt, very friendly and helpful. We will definitely return next year - very happy with our experience. Thank you!!! Tell us about your favorite feature of the property. We had a wonderful visit in Manzanita. The property is tucked away and quiet, but a short walk to the beach and the downtown area. It was spotless, comfortable and nicely appointed. We will be back again next year! We didnt work directly with staff, only through email which worked great.